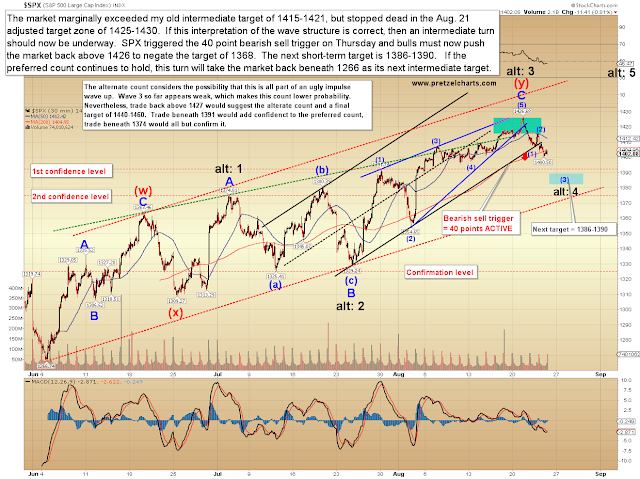 Well, so far, so good on my call for a top in the SPX 1425-1430 range, and I hope readers were able to take advantage of that. 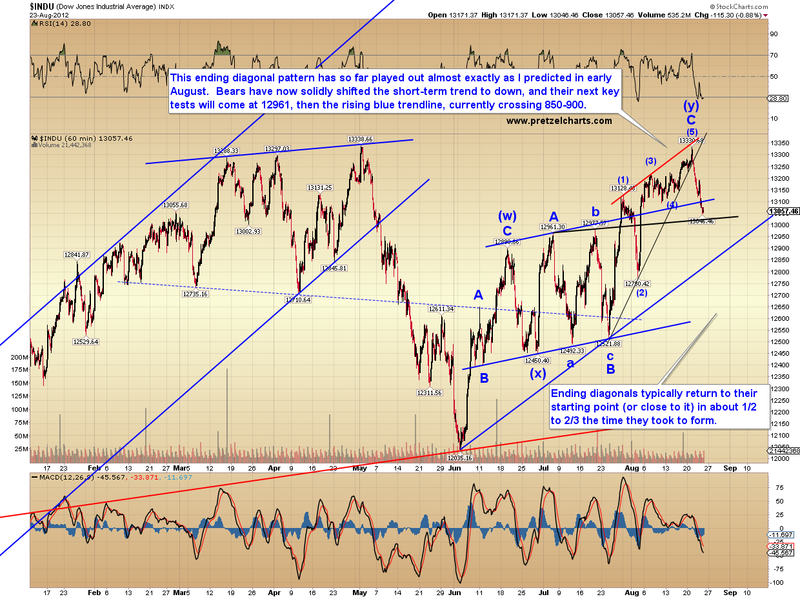 The market has lost a clean 26 points since then, and it looks like there's more downside still to come. I'm going to get right into the charts, since I had a server crash yesterday, along with a number of pressing personal issues, and simply don't have time for a verbose article. The chart annotations contain most of the relevant info. 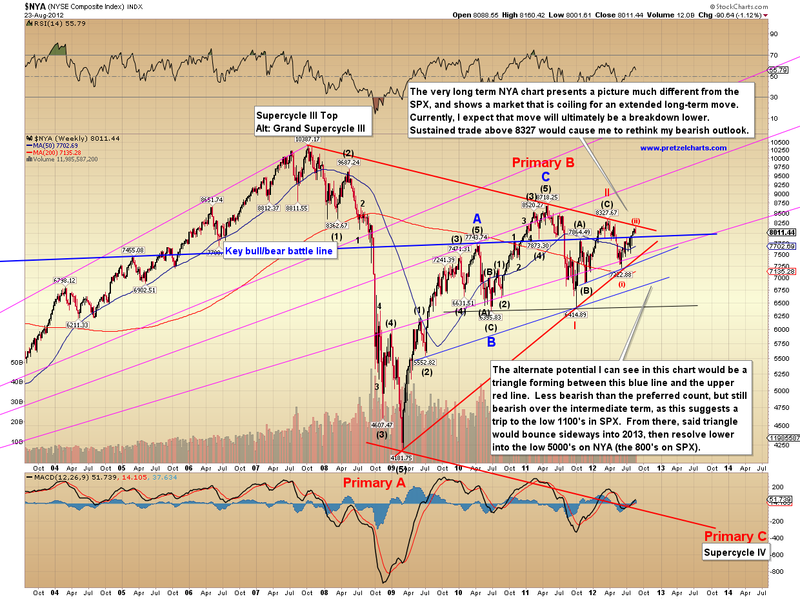 The first chart I'd like to share is my long-term interpretation of the NYSE composite (NYA). NYA is an excellent representation of the total market, as opposed to the Dow Jones Industrial Average (INDU) or the S&P 500 (SPX), which contain only the "best of the best" stocks. NYA is more like the average person's "balanced" portfolio. This chart helps provide some perspective on my current view of the big picture. 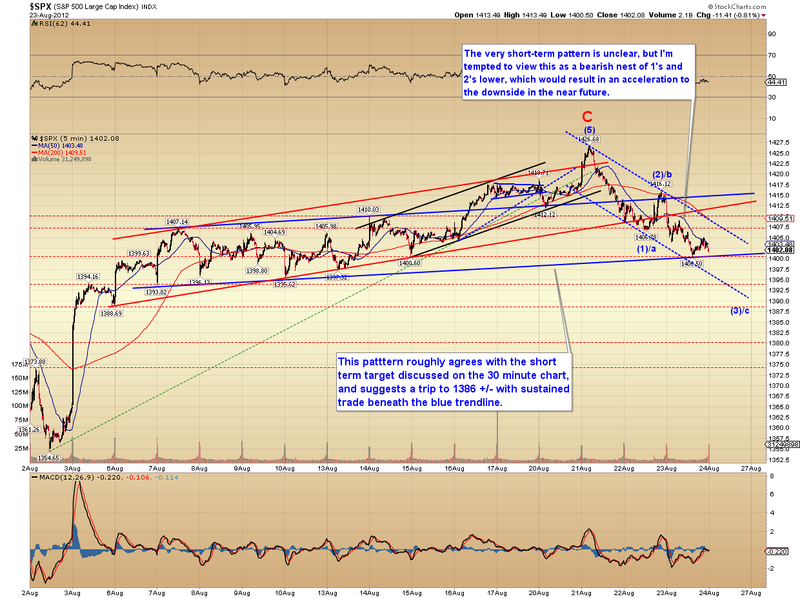 Next is the 30-minute SPX. My standing bearish 40 point sell trigger has finally become active. 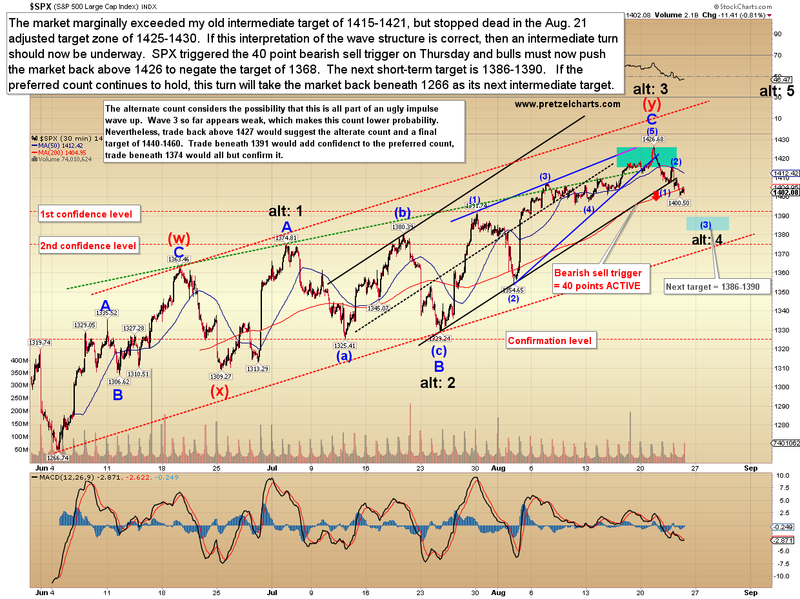 Trade back above the black trigger line would suspend the target, but trade above 1426 is required to completely negate it. 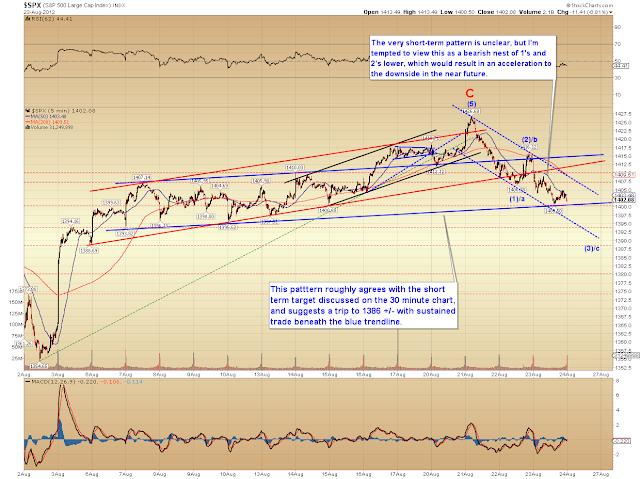 The next short-term target is 1386-1390. Finally, a quick update on gold, which is well on its way to reaching the target for the trade trigger I published a couple months ago, and which became active in July. I would suggest watching the high 1600's and the rising blue trendline (which is currently crossing about 10 points shy of the trigger target) as possible resistance. In conclusion, I probably couldn't have caught the recent top much better than the 5 point range I provided on Tuesday -- so why should I have any caution at all? Well, sometimes the patterns work perfectly over the short-term, then mutate into something unforeseen on the next larger timeframe. 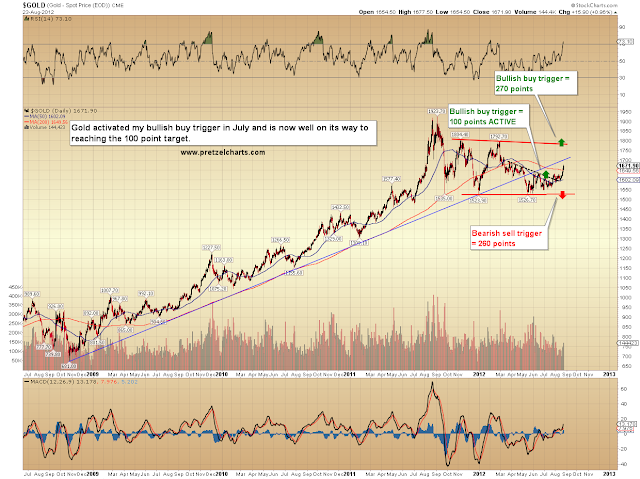 For this reason, I have given a brief overview of the long-term, but I'm holding off from getting too focused on longer-term targets until there's more confirmation in the charts. Just to play devil's advocate, I'll lay out what I believe would be the best-case scenario for bulls: over the short-term, it appears we're only about one-third to half-way through the current decline. Over the intermediate term: if bulls are somehow able to reverse the decline and muscle back over the 1426 print high, then the next upside target for a long-term top would only be the mid-1400's -- so, barring QE3, I see no reason to be long-term bullish here. That's best case for the bulls, and that potential currently appears to be the underdog. 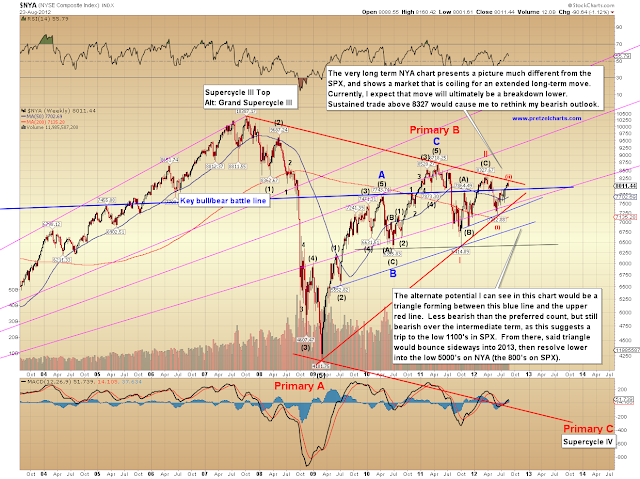 The market so far seems to be on track with my prior, and more-bearish, intermediate projections -- and there is currently no reason for me to doubt those. Trade safe. What would be the approximate level of the S&P 500 index if the Supercycle IV (Primary C) plays out from your big picture? you do an amzing job explaining things. thank you for taking time to provide this information.